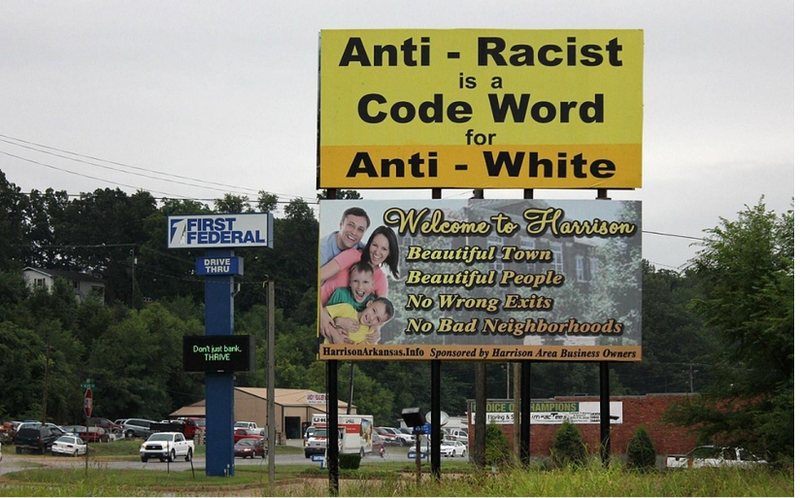 The small town of Harrison has been home to a number of controversial billboards lately. A new billboard in the small town of Harrison, Arkansas, was erected by the Ku Klux Klan to promote a white-supremacist radio station, KKK members have said. The billboard, which reads "It's NOT Racist to ❤️ Your People," was erected on Monday, according to the Harrison Daily newspaper. Thom Robb, national director of The Knights Party, told the paper his group was behind the advertisement. The billboard advertises the website "WhitePrideRadio.com," which redirects to a page for "KKKRadio.com." "It has always been our mission to not just promote the white family, but to make them a part of this cause of white Christian revival," the site boasts. The station promises its shows are "free of race mixing themes and the exploits of homosexuals – the kind of entertainment that is popular on television today – even on so-called "family" networks like ABC Family." The Klan's presence in Harrison, where it has its mailing address, has seen a number of controversial billboards erected in the town. A billboard erected in October 2013 read “Anti-racist is a code word for anti-white," although no one stepped forward to claim ownership of the sign. Harrison business owners erected another sign featuring a white family below the billboard, Al Jazeeera reported, that read," Welcome to Harrison. Beautiful town. Beautiful people. No wrong exits. No bad neighborhood." The signs were eventually replaced with other advertisements once their leases expired. "[Harrison] holds the unofficial title of America's most hateful small town," Al Jazeera wrote. On the white supremacist forum Stormfront, many prominent users praised the town's new billboard. "Just a few weeks ago, the Anti-White elites were celebrating the fact that the previous two billboards were removed in town. Haven't they heard that you can't keep a good Klan down?!?" wrote a user who identified himself as known neo-Nazi Billy Roper. "That is exactly what we wanted them to do," wrote another user, who identified himself as Thomas Robb. "I wanted them to celebrate and do their Hi-Fives. We could have put the billboards up the next day, but it is more fun to allow them to be puffed up and then prick their bubble. This sign is in even a better location than the others." The correct spelling of the group's name is Ku Klux Klan. This post originally misspelled it.